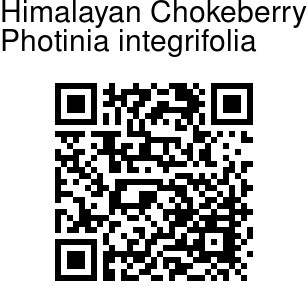 Himalayan Chokeberry is a small evergreen tree, 5-7 m tall. Leaves are shining, elliptic to oblong, 4-15 cm long, 2.5-8 cm broad, narrowed to a short leaf-stalk. Leaves are leathery, with 6-12 pairs of secondary nerves which are usually not well distinguishable from stronger tertiary ones. 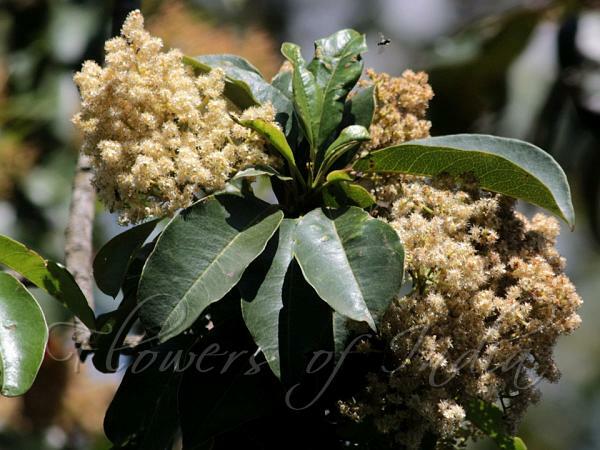 Flowers are fragrant, white, about 4 mm across, numerous in large spreading much-branched domed clusters. Petals are 5, rounded. Fruit is round, reddish to blackish- purple. Himalayan Chokeberry is found at altitudes of 1300-2800 m in the Himalayas, from Kumaun to Bhutan, Khasia and Mishmi Hills, N. Burma, Indo-China and China. Flowering: May-June. Identification credit: Rajib Gogoi, Ritesh Choudhary Photographed in Shillong, Meghalaya.